"...the music becomes a single organism that breathes and pulsates..."
On the 27th of June at 19:30 in Uppenbarelse-kyrkan in Hägersten and on the 1st of July at 18:00 in Kungsängens kyrka Ensemble Feria Vi will give summer-evening concerts. The program includes: Missa Praeter rerum seriem by Cipriano de Rore, Petite Camusette, Deploration sur la mort d'Ockeghem, and Scaramella by Josquin Desprez, Ultimi miei sospiri by Philippe Verdelot, Gratissima virginis species by Philippe de Vitry, Occhi piangete and Vecchie letrose by Adrian Willaert, and Sibylla Europaea, In hora ultima, and Allala pia calia by Orlando di Lasso. Eine feste Burg ist unser Gott, Wir glauben all an einen Gott, Erhalt uns Herr bei deinem Wort, and Nun bitten wir den heiligen Geist. On the 5th of November 2017 Ensemble Feria VI performed in Västra Ryds kyrka at 17:00. The program included: Domine Dominus noster and Quare tristis es by Orlando di Lasso, Sanctus from Missa Praeter rerum seriem by Cipriano de Rore, Beati pauperes by Adrian Willaert, Gaudeamus omnes and Angeli Archangeli by Heinrich Isaac, Sanctorum omnium by Dominique Phinot, and Absolve quaesumus by Josquin Desprez. On the 6th of January 2017 Ensemble Feria VI performed in Västra Ryds kyrka at 17:00. The program included: Viderunt omnes and Beata viscera by Perotin, Stella ista sicut flamma by Dominique Phinot, Quem vidistis pastores by Cipriano de Rore, In principio erat verbum and Jubilemus singuli by Orlando di Lasso, and Resonet in laudibus, Hört zu ihr lieben leute, and Ein Kind geborn zu Bethlehem by Michael Praetorius. On the 14th of February 2016 Ensemble Feria VI performed in Västra Ryds Kyrka at 17:00. The program included Missa Sub tuum praesidium by Jacob Obrecht, Invocavit me and Qui habitat by Heinrich Isaac, Media vita by Nicolas Gombert, Emendemus in Melius by Cristobal de Morales, and Qaul a l'incontro and Come falda di neve from Lagrime di San Pietro by Orlando di Lasso. On the 28th of June 2015 Ensemble Feria VI had a summer-evening concert in Västra Ryds kyrka at 18:00. The programe included: Das Gläut zu Speyer, Ach Elslein, Es taget vor dem Walde, and Wann ich des Morgens by Ludwig Senfl, Fumeux fume by Solage, Petite Camusette, Nymphes des Bois, and Scaramella by Josquin Desprez, Occhi piangete and Vecchie letrose by Adrian Willaert, Ancor che col partire by Cipriano de Rore, Allala pia calia and 5 movements from Lagrime di San Pietro by Orlando di Lasso. On the 6th of January 2015 Ensemble Feria VI performed in Västra Ryds kyrka at 17:00. The program included: Viderunt omnes and Beata viscera by Perotin, Stella ista sicut flamma by Dominique Phinot, Quem vidistis pastores by Cipriano de Rore, In principio erat verbum and Jubilemus singuli by Orlando di Lasso, and Resonet in laudibus, Hört zu ihr lieben leute, and Ein Kind geborn zu Bethlehem by Michael Praetorius. On the 30th of March 2014 Ensemble Feria VI performed Missa Praeter rerum seriem by Cipriano de Rore in Kungsängens kyrka. On the 24th of November 2013 Ensemble Feria VI performed in Kungsängens kyrka. The program included Missa Praeter rerum seriem by Cipriano de Rore, and De profundis clamavi, Benedixisti Domine, and In hora ultima by Lasso. On the 9th of March 2013, Ensemble Feria VI had an "Early late night concert" at Musikaliska, Nybrokajen, Stockholm. The program - The harmony of the never ending flow - included music by Gombert, Morales, Senfl, and Lasso. The concert was organized by the Stockholm Early music festival (www.semf.se). In 2012 Ensemble Feria VI performed a program with early Monteverdi madrigals on the festival "Omodernt" at Confidencen in Stockholm. They also performed the final concert in the Chamber music festival in Sundsvall in June 2012. Two very succesful concerts with "Lagrime di San Pietro" by Orlando di Lasso were also performed during 2012. The ensemle consists of seven singers. 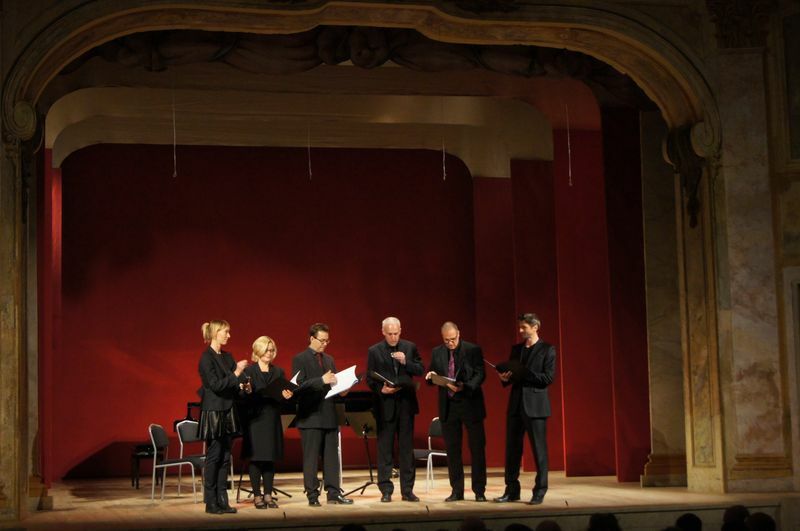 In the photograph below the singers are (from left to right): Caroline Wegmann, Leena-Maija Nee, Mikael Bellini, Hans-Peter Nee, Christian Wegmann, Gunnar Andersson, and Gustav Nordlander.